I love the simple sentiment in Payne’s words above. This author writes one of my favorite parenting books called Simplicity Parenting. The engaging philosophy behind it has changed the way Andrew and I view parenthood and has had a big impact on how we have gone about raising our little ones. These words, they are wise and true: we need rest in order to create, and likewise, adventuring and making and imagining help us rest better. Isn’t it a lovely goal, to rest well and recharge our souls so we can squeeze the most joy out of our days? I think the ebb and flow from both resting and creating is magnified with little ones. All day long our babies play and play and play and then nap time rolls around and…crash! Isn’t it completely wonderful when that happens!? Alfie took a three hour nap the other day and I swear I checked on him five times while he snoozed away in his nursery. I was in disbelief that he was really able to stay sound asleep for that long, but with all the crawling and growing of course he was tired! And then there are days, whether it be morning nap or night time, that getting the kids to calm down and go to bed is quite the chore. We have three little ones so of course we have been there before. After supper I am usually pretty exhausted myself and ready to swan dive into my own covers! To make things easier on everyone, Andrew and I practice calming rituals with our kiddos before putting them to bed. Even though we have little ones at three different ages it’s important to us that our rhythm remains consistent for each. Establishing a routine and sticking to it is the key to a calming bedtime, and here are a few ideas to help you get the right rhythm going for your family. I am including all the things that we do, plus sticking in a few extras to give you guys a few new things to try. Because we all respond differently to various approaches and styles, try some of these on and see what fits. Sometimes all it takes is a gentle reminder that there are wonderful ideas out there to help us moms and dads out! Bubble Bath: One of the most comforting ways to calm down our little ones is have bath time right before hopping into bed. 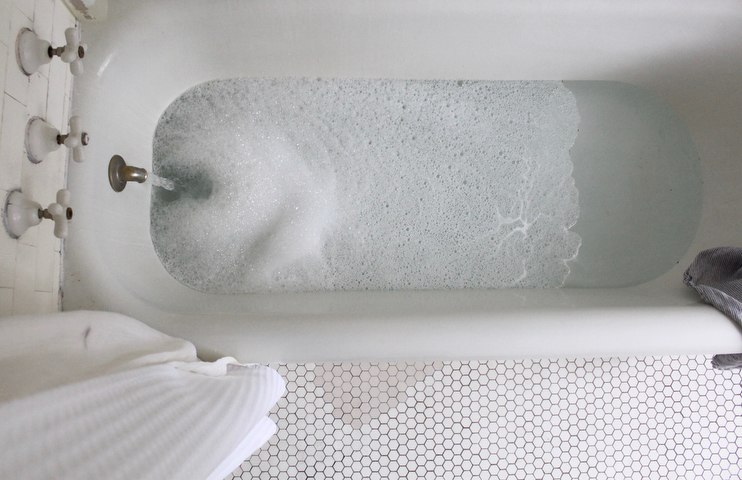 I love taking long bubble baths at night to relax and the kids also enjoy soaking before we settle in to read books after supper. We have been using the Chamomile Verbena Bubble Bath made by Babyganics for awhile now because it is really comforting and makes big bubbles for the kids to play in! Bubbles are key. I picked up their Night Time Bubble Bath with natural Orange Blossom scent a few weeks ago, and it too smells so lovely. For those who aren’t familiar with this wonderful company, they make baby-safe products made with a variety of plant-based, natural and organic ingredients. As a mother I really value their mission. Lotion or Gentle Baby Balm: After bath we moisturize the kid’s skin with coconut & essential oils that have soothing ingredients like lavender and chamomile and rose that also help calm them before bed. If you are having troubles getting your bubs to nap, I would try doing a little massage before nap time as well. We do this with Alfie a lot and it seems to really help him relax. Brush teeth: Beyond the fact that it’s super important for health reasons, brushing teeth before bed helps send your body “go to sleep” signals so we have woven this into the kids routine as well. Wash face: More signals to tell your little one it’s time to sleep. Stella likes using the Babyganics Night Time Shampoo + Body Wash for this. It has the same lovely 100% natural Orange Blossom scent as the Bubble Bath. 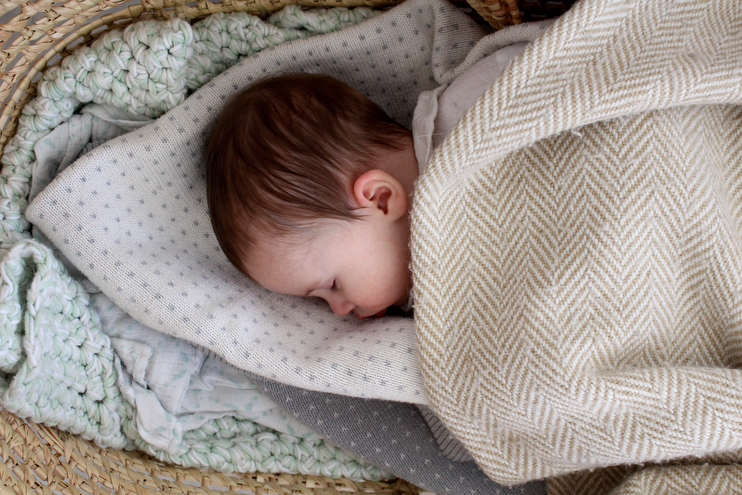 Calming Linen Spray: We use a linen spray made with lavender + cedarwood + chamomile essential oils on the kids’ blankies and pillows before tucking them in. It smells wonderful and helps them sleep well. I spray two to three sprays on their blankies and pillows before tucking them in. You can find more linen spray recipes here. Pick out PJs and tomorrow’s outfit: Inviting your older ones to pick out their clothes for bed and for the following day is just one more way to give them a bit of control before bedtime. We have built this into Stella’s routine and she enjoys that choice. I pick out three outfits and she gets the final say of which one she wants to wear tomorrow. Potty + a jar of something to drink: We give Stella one last chance to use the potty before bed and to fill up a small glass of warm milk with honey or water. Doing this with her prevents her from getting out of bed shortly after we lay her down. Reading stories: The ritual of reading before bed is something we started with Stella when she was itty bitty. We would choose a few books and read them before tucking her in, both before every nap and bedtime at night. Now that she’s older we let her and Theodore pick out their books. They love selecting a few and snuggling in with us to read. Bedtime yoga: For the very active bub you can give this a try. We like doing morning stretches over here and I think bedtime yoga could also work well to calm down the body and get your little ones ready for sleep. You could spray your yoga mat with the bedtime linen spray to help create a relaxing mood. Diffuse Oils: We diffuse essential oils to create a calming environment while reading and getting ready for bed. I like diffusing the following oils before bedtime: lavender, chamomile, orange, tangerine, gentle baby, peace & calming, and stress away. Talk quietly about the day: If the kids are really wound up we will do a combination of the above routines and snuggle up in bed with them talking about their day. Connecting like this is just as special for our kids as it is for us parents. I will ask Stella, “What is your favorite memory of the day? What was your favorite activity from today? What are you looking forward to tomorrow? What do you want to dream about? Who do you wants to pray for?” Those types of things. Pick a time: Last but not least, pick a time to send the kids to bed and stick to it. Ours is seven each and every night! I’d love to hear what natural, calming rhythms and routines work for your family! Do you have a go-to technique or routine that you stick by? This post was sponsored by Babyganics. All opinions are my own. Thank you dear reader for supporting the brands that support Homesong. 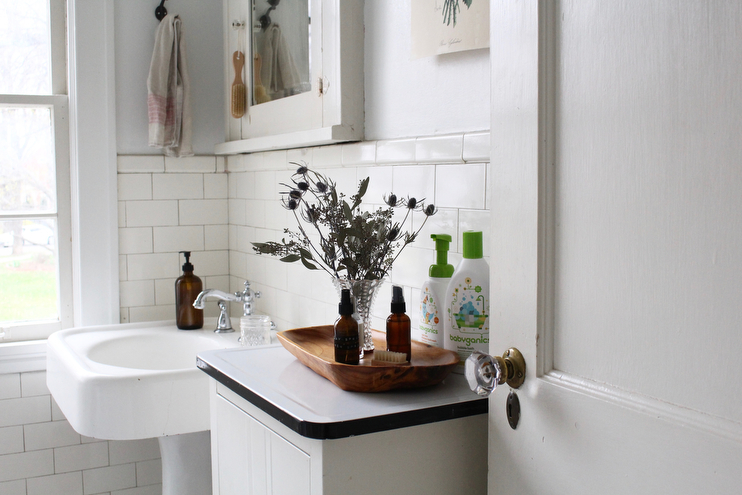 The love-in-a-mist in your bathroom looks very pretty. I think my favorite flower. It is so nice to have around, fresh or dried. I will be growing a lot of it this year. I, too, have a set bedtime for my son. We always have. I thought it would be contested as he gets older (eight), but it is a peaceful decision that he makes instinctively. Routine can be pretty wonderful sometimes. Happy to have stumbled upon your blog.